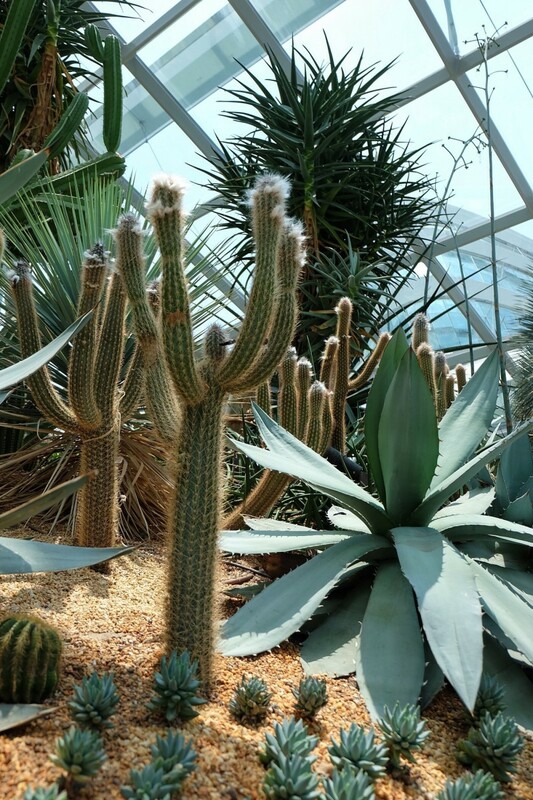 On our third day in Singapore, we headed to the Marina Bay area to visit Gardens by the Bay, which has huge, spectacular indoor and outdoor gardens. The outdoor ones are made up of super tall metal structures that look like flowers on elongated stalks, opening their petals to the sky. The metal frames are covered in plants and flowers, and ground cover includes huge palms, dense bushes and plants, amid meandering tiled paths. Everything looks ultra modern so that we totally agreed with Rowan when he said the grounds looked like they were from an alien planet. We took an elevator to the top of one of the structures and walked across an elevated boardwalk to a second giant flower, admiring the view of the Bay Area and the indoor gardens in the distance. They are cocoon shaped, metal and glass buildings, and made the area look even more alien. 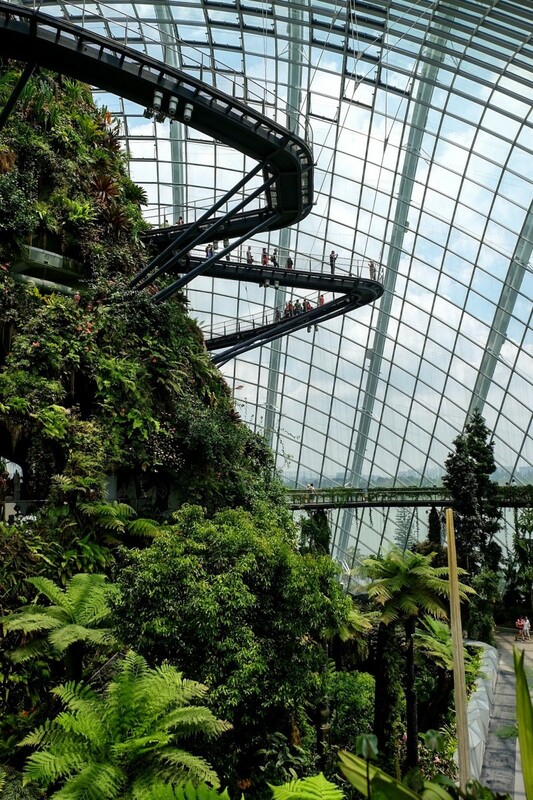 The first indoor garden, the Flower Dome, was simply gigantic, stretching across three levels, with examples of 2 million plants from more than 10,000 species from around the world. We had a great time touching different plants to feel their textures and reading their nameplates to find out where they came from. Rowan’s favourite were the cactuses. Our next stop was the indoor Cloud Forest, which had the world’s tallest indoor waterfall. It also had a metal mountain structure, covered in plants and flowers, reaching to the top of the building. We took the elevator up six floors and walked down an elevated platform that wound around the mountain. 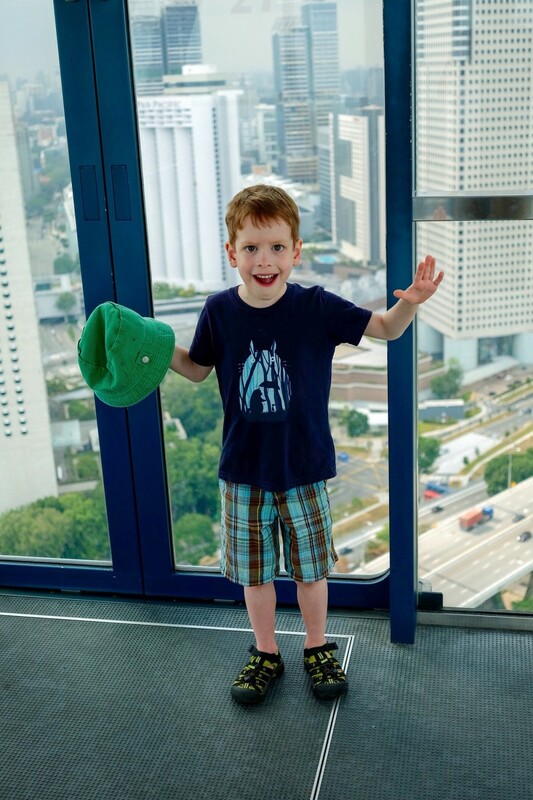 Then we headed to the Singapore Flyer, which is a giant ferris wheel with closed, air-conditioned cabins, rather than seats. It moves super slowly, around, giving you a 360 degree view of Singapore and we had fun on the 30 minute ride, taking pictures and looking at how small everything looked down on the ground. After a quick subway ride and a stop back at our hotel, we headed out to a vegetarian restaurant that Kevin had discovered the night before. Turns out it is known as Singapore’s best vegetarian restaurant. It was awesome. We all had amazing noodle and veggie soups, with mock crab, which was interesting, and Rowan had a watermelon juice, which he adored. It was a beautiful, warm night and we walked around the streets in our neighbourhood for a while, listening to the music pouring out of the shop fronts, restaurants and bars. 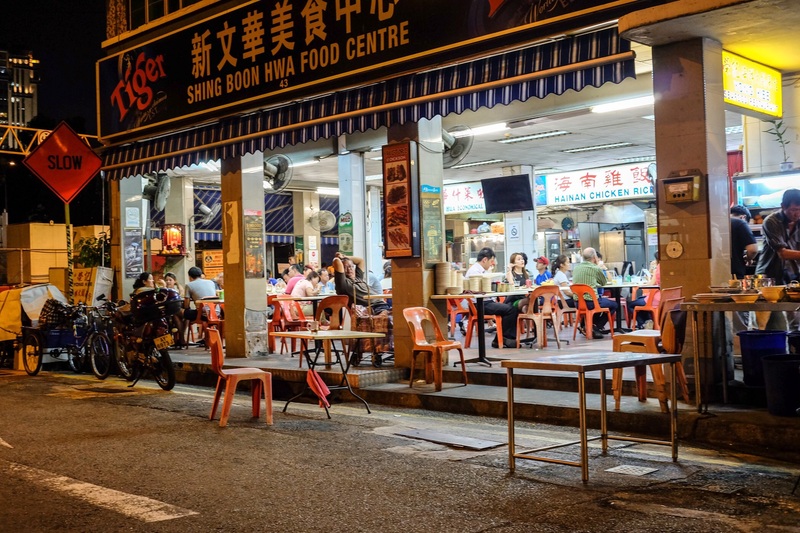 We sat down for a drink at an outdoor restaurant on our street and enjoyed the happy and relaxed night life before heading to bed. Hi Rowan you look so happy in that Photo, the 3 of must be having a great time.